The world of makeup is growing faster than ever. It can be overwhelming even to those of us who are veteran makeup users. 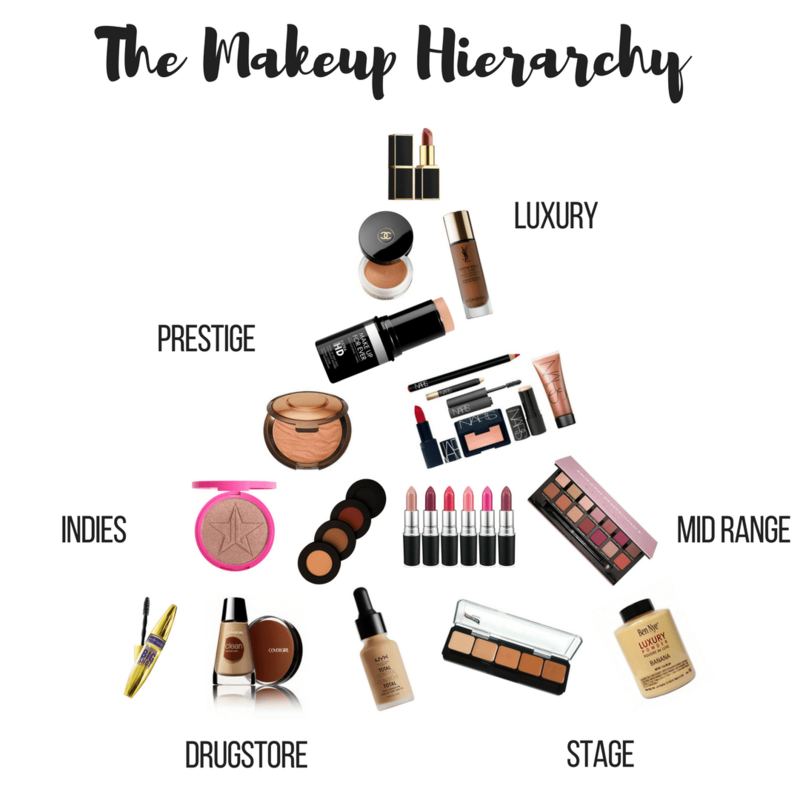 So today I’m going to try to go back to some basics and explain how I categorize makeup brands, and a little info about each to help guide you in your future purchases. The lines between categories aren’t always clear and everyone won’t agree, but let’s see how this goes! At the top of my pyramid I have luxury brands, duh! Luxury makeup brands are usually tied to luxury fashion brands (but not always). Luxury = expensive! These brands are not for those who are penny pinching. It’s all about having an expensive feeling experience from the packaging on the outside to product on the inside. Luxury brands have beautifully designed, elegant and high quality packaging to give the products that luxury feel. 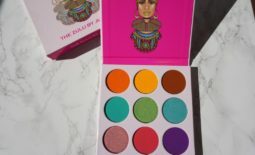 So the products are expensive, the packaging is gorgeous; does that mean the product inside is worth the money? Not always! I’ve found the performance of luxury brands to be hit or miss depending on the product. Also lots of luxury brands tend to have small shade selection when it comes to base products for women of color, or when they have them they’re terribly made (hey Marc Jacobs). Long story short, before I cash out on luxury brands I always try to get samples first and purchase at a store with a quick and easy return policy just in case. Next up we have what I like to call prestige brands. We all know Ulta has what they call their “prestige” brands but I think they’re a little too general in their categorization. 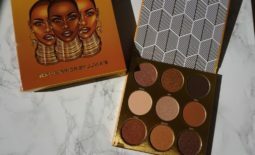 What I consider prestige are those brands that you can get at Ulta and Sephora but are slightly more expensive than the “average” or “mid-range” makeup brand. In my opinion, prestige brands focus on quality over quantity. They’re not putting out huge new collections every month but what they do release every season is consistently high quality and on trend. Prestige brands tend to have a wide shade range for all skin tones in their base products, which is a real winner for me. 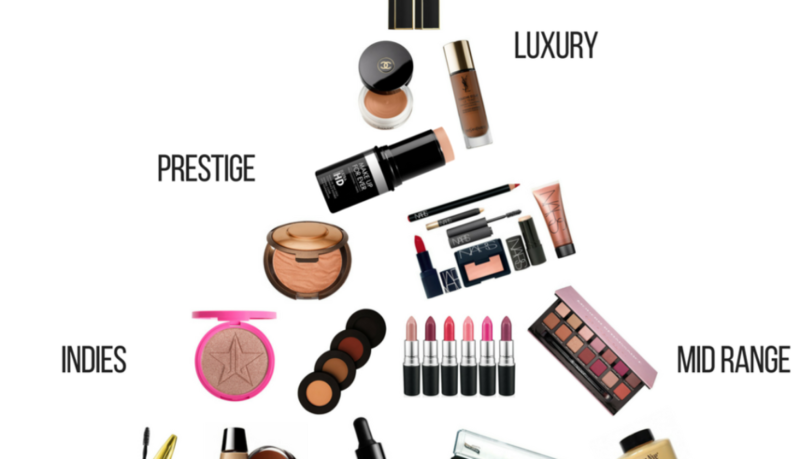 Prestige brands are usually my favorite because they’re the perfect balance of good quality, current trends and accessibility. We’ve reached to middle of the road. Mid-range brands are super popular and spark insane Instagram hype whenever they tease us with a new product (which is basically every other day). These brands are easily accessible, affordably priced, leading the trends, and constantly releasing new products. We all love them, they have a cult like following, and major social media influencers on their teams. I feel like quality can really vary depending on the brand amongst this category. I feel like some brands are staying alive off of cute packaging (hi, Too Faced) and influencer hype (hi, Tarte) while other brands really make consistently great products (ABH, hey boo!). Most people can and will find something they love from these mid-range brands. Now indies (aka independently owned and produced makeup brands, if you’re feeling fancy) is really the hardest category to put your finger on! Because they’re independently owned and produced there’s huge variation between brands in price and quality. This could really be it’s own separate blog post, and maybe one day it will be, but for right now what I will say about indies is DO YOUR OWN RESEARCH! Most indie brands are available exclusively online or have very limited physical presence (local stores, or trade shows only) so you can’t touch and play with the product before you buy. There are also PLENTY of independent brands with histories of terrible customer service, bad/moldy/broken products, and those just owned by terrible people. Luckily in the age of digital beauty that we live in, it’s usually not hard to find a blogger or youtuber who has reviewed, swatched and tested an indie product/brand before you purchase. Also beware when doing your research of who’s being paid to say good things (usually the ones who LOVE everything) and honest reviewers. Ah! The local drugstore the place where most of our makeup addictions began! Drugstore makeup is inexpensive and easy to find. It’s perfect for beginners because you can really play around with it and learn what you like before moving on to more expensive purchases. In recent years drugstore makeup brands have really stepped up their game. Brands like Maybelline, Loreal, NYX, Milani and more are releasing trendy collections, with high quality, and a great shade range*. While other brands like Physicians Formula, Almay, and Rimmel are lagging behind in a sea of ivory foundation shades. A cheaper price does not equal a lower quality product. There are plenty of drugstore products that I and other beauty lovers swear by. You’ll have to pry my Maybelline mascaras and LA Girl concealers from my cold dead hands tbh. I definitely recommend purchasing mascaras, lip liners, eye liners, and lip gloss from the drugstore, because I go through them insanely fast and the quality is usually on par with more expensive brands. Lastly but definitely not leastly, we have stage makeup or pro artist only brands. Like I said before the lines between categories can definitely get blurry and this one of those areas. 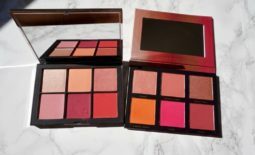 These days with the popularity of makeup traditionally “pro artist only” or stage makeup brands are becoming more common with your regular everyday makeup user. I mean, who doesn’t use Ben Nye Banana Powder these days?!? 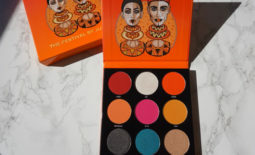 Also there are other brands like Makeup Forever and MAC that serve both the professional makeup artist community and the everyday makeup user. Side note: If you love Halloween like I do, these are the brands that carry everything you need to make crazy Special FX and face painting! Stage makeup is made for performance and special FX so products are highly pigmented, long wearing, and a lot of the time waterproof. These qualities can be a blessing or a curse depending on the person that is applying them, so proceed with caution. Because stage makeup is used for creating all kinds of crazy characters you can find pretty much any color in the rainbow that you’re looking for. Another great thing about stage brands is that they’re generally inexpensive for the amount of product that you get. So what do you guys think? Shout out to you if you read all of that! My list of brands is obviously not exhaustive but I think it gives you a pretty good idea of what’s out there. What’s your favorite “category” of makeup? I love prestige brands but I really want to start exploring indie brands a lot more because there’s just so much out there to try!